Hans Bolling: Wooden Duck. Hand-Crafted HANS BOLLING DUCK made in Denmark from Teak Wood. Special: $148.00 instead of $180.00. Hans Bolling's wooden figure duck. This adorable wooden duck is cute as a button and is the perfect present for young and old! This classic Danish duck design figure comes packed in a beautiful gift box. Can be combined with the smaller Ducklings (sold separately). Believe it or not but the world famous Bolling Duck was designed in 1959. That's half a century ago for all you fellow duck lovers! Hans Bolling's wooden Duck is made in Denmark from teak and limbawood. The Bolling Monkey is a genuine piece of modern Danish design made with superior craftsmanship. In 1959 during a busy day in Frederiksberg, Denmark, a policeman stopped the traffic in order to allow a young family of ducks to cross the road. Inspired by the photographs in the newspapers, architect Hans Bolling designed the duck and duckling. 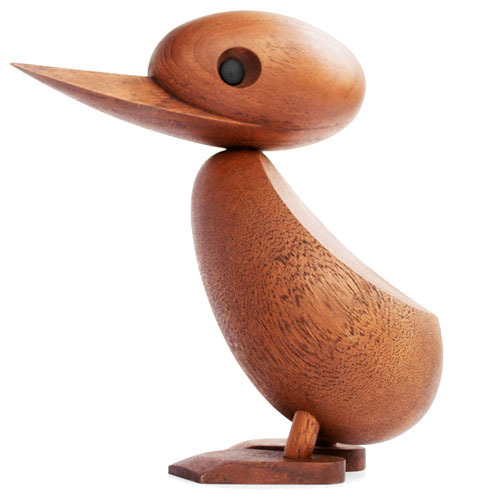 Made from teak the duck and duckling have become iconic Danish designs. This is not a toy. For decoration only. Who can resist these adorable Duck and Duckling?